Do you remember when Steven Colbert gave the world's least-funniest-funny speech at the White House Correspondent's dinner? The speech was funny on paper, but ended up being quite scathing because much of what Colbert said was so close to the truth, it was embarrassing. Especially to a president who lead a war to find weapons of mass destruction that didn't exist. The speech landed with a thud. Last night, Colbert's Comedy Central colleague, Jon Stewart, did just the same kind of thing on his The Daily Show. 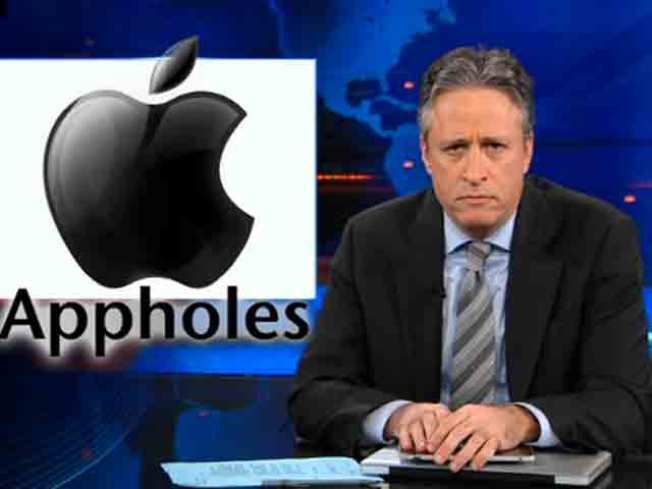 Stewart took Apple to task for its role in the bizarre lost iPhone scandal. Pretending to address Apple CEO Steve Jobs, Stewart asks, "You guys are busting down doors in Palo Alto while [Bill] Gates is ridding the world of mosquitoes. What the f**k is going on?" The fact that Apple didn't actually bust down blogger Jason Chen's door in Fremont is irrelevent. The point is sharp and wounding. "And that right there is why Apple will probably be paying more attention to this than it did to myriad blog posts about the iPhone leak."